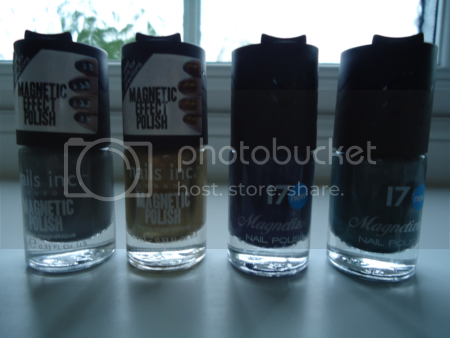 I had such a positive experience with Nails Inc magnetic nail polish that I was interested to try another brand's version and see how they compare. I decided to try 17 from Boots. I couldn't find it in store so I bought two colours - blue and teal - off their website. The bottle design is idential to the Nails Inc one. It's a 10ml bottle with a detachable magnet cap. Both caps also have a little lip that you rest against your cuticle to line up the magnet. So I could try both colours at once, I alternated the colours on each nail. As with the Nails Inc polish I did two coats of each, the first coat obviously without the magnet and the second holding the magnet over the nail while the polish was wet. It was incredibly easy to do. I then sealed with a top coat to make it super shiny. These photos were taken after three days so there's a bit of tip wear, but no chipping. As you can see, the blue has a more subtle effect than the teal but I like both colours equally. They're just so pretty. 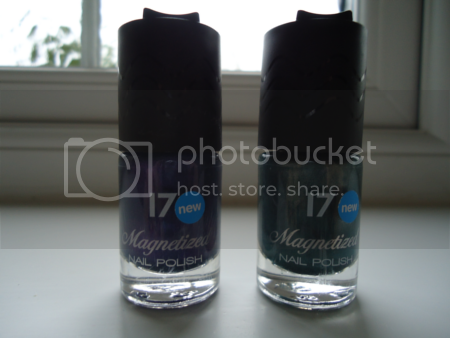 So if you were only going to buy one magnetic polish, which brand should it be? Well, the Nails Inc formula was definitely superior to the 17 one. I can't fault the former, which I found the latter a bit gloopy. It wasn't bad enough to cause any real problems, though. 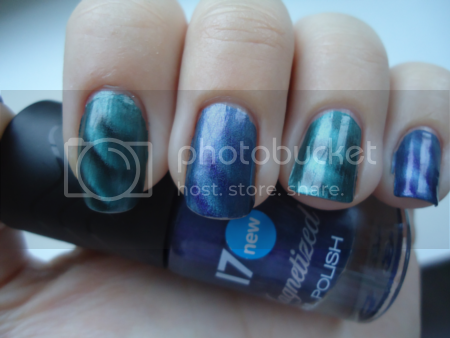 17 has a choice of four colours (silver, lilac, blue and teal) and Nails Inc has three (gold, silver and purple). But the most obvious difference is in the price. I got the 17 polishes for £4.99 each, while the Nails Inc ones were a whopping £13! In spite of the inferior formula, for more than half the price and a wider range of colours, I'd personally go with the 17 polishes.